Apparently, cookie butter is the new pumpkin spice. 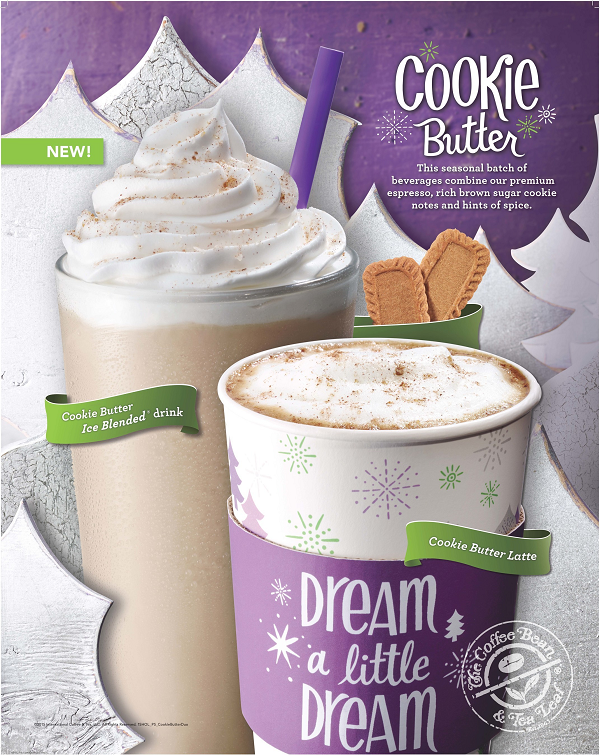 The Coffee Bean & Tea Leaf has debuted its new holiday beverages: Cookie Butter Latte and Cookie Butter Ice Blended. The new beverages are made with espresso, brown sugar and gingerbread, and topped with cinnamon sugar. Also returning for the holidays are the chain’s Winter Dream Tea Lattes, Peppermint Mocha Lattes and Ice Blended drinks, Peppermint Hot Chocolate and Red Velvet Hot Cocoa. 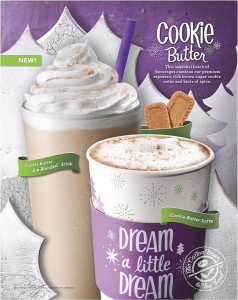 The Coffee Bean will be showcasing the new cookie butter beverages, as well as the Winter Dream Tea Lattes and the Peppermint Mocha Lattes and Ice Blended drinks during a holiday beverage tasting event from 2 to 6 p.m. Thursday (November 5). During the event, guests can purchase a small size of any of the featured beverages for just $2, of which $1 is earmarked for The Help Group, a non-profit serving children, adolescents and young people with special needs related to autism spectrum disorder, learning disabilities, ADHD, developmental delays, abuse, and emotional problems. In addition, The Coffee Bean will donate $1 to The Help Group for every pound of Holiday Blend Coffee or 20-count Winter Dream Tea tin sold. Plus, from November 27 to December 28, customers can help “Deck the Walls” and decorate local store locations with personalized holiday decals by donating $1 to The Help Group. The Coffee Bean’s holiday beverages will be available through December 28. Inland Empire locations include Rancho Cucamonga, Claremont, Redlands, Fontana, Chino Hills, Riverside, Palm Springs, Palm Desert, La Quinta, Indio, Lake Elsinore, and Temecula.